I first visited this community owned establishment situated on the flanks of Volcan Tenorio in 1999 after reading about it in my Lonely Planet guide book. It was just a brief mention of a place that was community owned, had low rates, and was located in a region that I had not previously birded. There wasn’t any talk of fantastic birding or anything that would have revealed the potential of this place. Nor do I recall the book hinting at the rough weather that is a common feature of Heliconias. 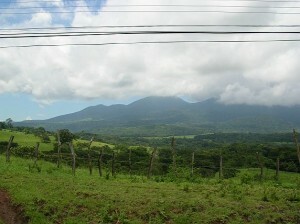 Heliconias Lodge, Costa Rica is somewhere up there. On that first trip, there were few trails and the weather was typically bad with wind and misty rain that seemed to have a serious soaking agenda because it tended to “fall” in a sideways fashion for maximum drenching effect. Despite these wet, challenging conditions, I managed to see Ornate Hawk Eagle, Song Wrens, Spotted Antbirds, and other interesting species such as Long-tailed Manakin. I also became acquainted with Nicaraguan television broadcasts (one can see Lake Nicaragua from the lodge) while watching the TV in the lodge restaurant in an attempt to stay dry but that merits it’s own story. The view from Heliconias Lodge. I also came away with the impression that the habitat at Heliconias Lodge was pretty high quality and merited further investigation. I made a second trip with Robert Dean a couple years later and although we had to deal with similar bad weather, a few days of intensive birding yielded a number of bird species that are generally difficult to see in Costa Rica. These were things like Yellow-eared Toucanet, Lovely Cotinga (my one and only- a dove-like female), Sharpbill, and the prize of Heliconias- the Tody Motmot. Six years after that second trip, I visited Heliconias for the third time and although the weather was the same windy, drizzly stuff, the lodge had improved their trails and put in a few canopy bridges! They also had trained, local guides who knew the birds, had owl species staked out, and were getting a fair amount of business. On that third trip, we saw Tody Motmot again, watched White-fronted Nunbird feed from the second canopy bridge, and had very good birding overall. I also took very fuzzy pics of Crested Owl like this one (the lighting conditions in the forest had passed from being dim to downright dark). 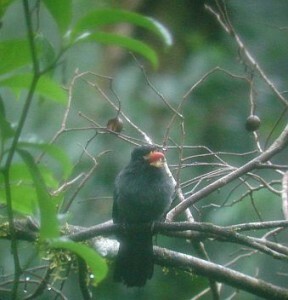 White-fronted Nunbird hanging out on the bridge. With deforestation, White-fronted Nunbirds have become uncommon in Costa Rica. My friend Ed Mockford posing on the second canopy bridge. This past weekend, I finally got back to Heliconias to co-guide a trip with the Birding Club of Costa Rica. The fourth time must be a charm for Heliconias Lodge because I got a break with the weather. Instead of being cool and damp, Heliconias Lodge was experiencing unseasonably hot and sunny weather that converted some of our rooms into temporary saunas. This also put a warm damper on bird activity but not enough to prevent us from seeing several, high quality species on trails that accessed excellent, foothill, primary forest. Great Curassow– Two males were “mooing” like mad cows near the entrance to the canopy bridge trails. At least one gave us views of its curly-crested head as it peered at us from within the dense understory. Crested Guan– Nice, close views from the canopy bridges. American Swallow-tailed Kites swooping around the lodge, one with a lizard in its claws. Long-billed Starthroat– the most commonly seen hummingbird species around the lodge. Black-crested Coquette– we had a female upon arrival and I fully expected to get pictures of it at some point during our stay but it just never reappeared! Tody Motmot– Heliconias is the most accessible site for this miniature motmot in Costa Rica although they are still tough to see. I heard at least 7 pairs but saw just two of these toy-like birds. Yellow-eared Toucanet– One lucky club member got good looks before it disappeared into the dense foothill forest. Spotted Antbird– We saw several of these with and away from antswarms. They seem to be more common at Heliconias than other sites. Ocellated Antbird– Nice looks at a couple of these fancy antbirds at a good antswarm on our final day. Streak-crowned Antvireo– Several good looks at this rather uncommon forest species. Sharpbill– Our second guide heard one of these strange birds singing from the canopy. Song Wren– We had a pair of this reclusive forest interior species. Nightingale Wren seems to be fairly common at Heliconias. They are still tough to see but a lucky club member watched one of these little brown birds from the balcony of her cabana. I think we would have seen much more too with a one or two more days because we didn’t run into any tanager flocks (Blue and gold and others are sometimes seen just in back of the cabins), and saw very little from the canopy bridges (I had fantastic birding from them on my previous trip to Heliconias). We also didn’t go owling which could have resulted in several species more. The view into the rainforest canopy from the second bridge at Heliconias Lodge, Costa Rica. Speaking of owling, Heliconias and Bijagua are probably the most diverse site for owls in Costa Rica. According to Local guide Jorge Luis Soto ten species of owls have been recorded in the area! 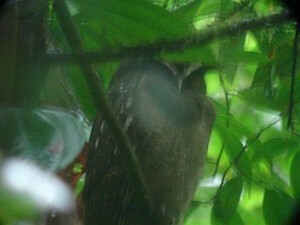 Although we didn’t get lucky with any roosting owls, they often have Mottled, Crested, and Black and White Owls staked out (Black and White Owl also hunts at the streetlamp near the lodge entrance), Spectacled Owl, Vermiculated Screech Owl, and Central American Pygmy-Owl are uncommon residents of the primary forest, Pacific Screech Owl Occurs in the pastures below the lodge, and Tropical Screech Owl replaces it in the town. The owl tally is rounded out with the two widespread species of open country- Barn and Striped Owls. This is already more species of owl than any other area in Costa Rica and two more are also possible- Ferruginous Pygmy-Owl might be found within a half hour drive towards the Pacific coast, and Bare-shanked Screech Owl may lurk in the cloud forests higher up on Volcan Tenorio. It’s the most regular site for Rufous-vented Ground-Cuckoo in Costa Rica. This extremely shy, distant cousin of the roadrunners has been seen on many occasions as it forages with army ants. I think we actually came pretty close to seeing one with the antswarm that we ran into on the day we left Heliconias but just couldn’t stay with the marauding ants long enough for the cuckoo to show up (it was time for us to drive back to San Jose). The ecotonic location of Heliconias means that one gets foothill and middle elevation species around the lodge, lowland species below the lodge and in the town, and dry forest birds within a half hour’s drive. Dry forest species sometimes also show up at the lodge itself such as Cinnamon Hummingbird did during our visit, and Thicket Tinamou has done in the past (three other species occur and if Highland Tinamou lives in the cloud forests at the top of Tenorio, that would also make this bird-rich site Costa Rica’s tinamou species hostpot). The quality of the habitat. This is really the main reason why the birding is so good at Heliconias. Maintained trails pass through beautiful, high quality, primary forests. The height of the trees and complexity of the vegetation somewhat reminded me of the Amazon (or maybe the Amazonian foothills) and because of this, Heliconias is one of the few sites in Costa Rica where I would love to spend an entire week (or more) just exploring the forest. Snakes are also a good sign of high quality habitat. I have seen at least one snake on every visit, and saw three on this most recent trip: an Oriole Snake slithering through the canopy, an unidentified plain-looking non-venemous species that raced away from the trail, and this yellow phase Eyelash Viper tucked into a nook on a trailside tree. Management and guides. Although we ran into some minor communication issues during our stay, overall, the trip had few kinks, service and food were good, and local birding guide Jorge knows where to find birds both at the lodge and at nearby locations. Heliconias is pretty easy to get to and is a quick four hour drive from San Jose on good road until the turn off from Bijagua. At that point, a four-wheel drive works best but even low cars could make it up the stony road if they take it slow and easy (conducive to birding in any case). I hope the interval between this and my next visit to Heliconias will be measured in months rather than years because I still need to explore the forest around the laguna (which harbors Keel-billed Motmot and who knows what else). Glad to hear you will be visiting Heliconias. Although it’s a bit off the regular birding track, it’s always worth a visit. The habitat is excellent in addition to lots of birds, I have also seen snakes every time I have been there. 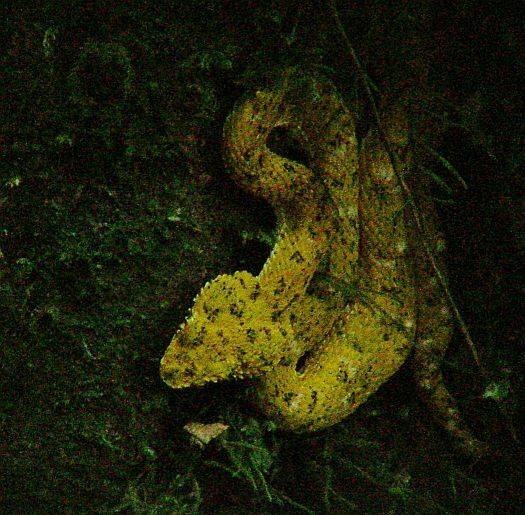 In fact, I would love to spend a week at Heliconias to have enough time to look for owls and herps during the night. @Pete- I don’t have that but if I get it, will let you know.